Puhuin maanantaina 18.2. 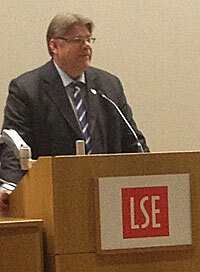 London School of Economicsissa ajatuksistani eurosta ja Euroopan unionista. Paikalla oli reilusti yli sata kuulijaa. Alla puheeni englanniksi. Suomenkielinen versio julkaistaan lähiaikoina. 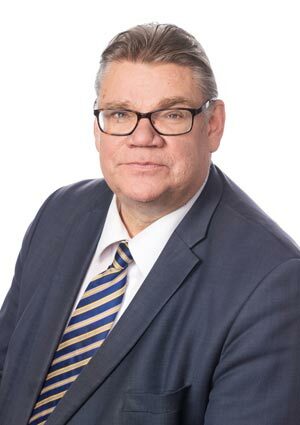 I am Timo Soini, a Member of The Finnish Parliament and the chairman of the Foreign Affairs Committee in our Parliament. I represent the Finns Party – I’ve been the Chairman of the party for sixteen years and, at the moment, I’m the leader of the opposition in the Finnish Parliament. I’ve also been regarded as the seventh most dangerous person in the world by the Spiegel, thanks to my Eurosceptisism. Obama was on the sixth place so I’m in good company. I also sat in the European Parliament from 2009 to 2011. After that, the Finns wanted to have me back in the last general elections. Before that, we had 5 MPs and now, after the phenomenal victory, we’ve got 39 seats and we are third biggest party in the Finnish parliament. I wish to thank you for the invitation. It is a pleasure and an honour to be here with you. So, what do I think of the European Union? Well, it certainly keeps me and other MPs busy with hundreds of pages of red tape, directives, recommendations et cetera sent from Brussels every week. In fact, I think every minute a patch of forest, size of a football pitch, is cut down in order to produce enough paper for EU technocrats. I’m sure there’s some scientific evidence to prove me right. At least there should be. But let’s cut the cackle and come to the ’orses. There is more open internal market, eased border procedures, people have a chance to live and work in another country, there’s more conservation, and there’s Erasmus exchange student programme… just to name a few. But of course, every institution has its own cons, too. And the European Union certainly has its own flaws. The biggest one is probably the lack of democracy. We have a commission which is the only organ that can make initiatives. And who elected them? If you’re not satisfied with their actions, how can you fire them? How many of you voted for, say, Mr Barroso? Or Olli Rehn? Mr Rehn comes from Finland and even we were not asked when he took his seat as a financial commissioner! We have seen some scandals in what we call Brussels-style democracy: A few years ago, the new EU constitution was put under a referendum in France, Holland, and Ireland. The people said no. Well, then the name was changed and the Irish were forced to vote again. Why? Because they failed to give the correct answer on the first round. Can you really call that democracy? Think about it. What if the British followed the same rules? In the general election, the Labour Party wins… and then the authorities say: OK, false result – let’s vote again. I’m certain there would be lots and lots of people demonstrating and saying: this is not right! This is not democracy! And where is the opposition in the European Union? Can there be one? Are you allowed to criticise the EU is still be taken seriously? Or are all EU-sceptics regarded as some barmy idiots from Cloud Cuckoo land? Also, I cannot understand why the EU keeps on breaking its own rules: the articles 123 and 125 in the Lisbon Treaty ban all bail-out schemes and financial help between the member countries. And yet, those rules have been frequently violated. How dare they!? And they do dare! One more flaw: development towards federal state and the end of national sovereignty. Pretty soon, the member countries must seek approval for their national budgets from Brussels. A considerable amount of legislation comes from Brussels, and those directives can overrule our national laws. I believe it is high time we stood up for European nations. You here in Britain, we in Finland, and people in other European countries need that attitude. We must stand up for the nations. The current political system in the European Union has more or less met its bitter end. If you look around, can you honestly say the member countries and different nations are working together for the best of this fabulous continent? Internal tiffs and futile rows between pompous euro big wigs and their enormous mistakes eat up all strength, money… and democracy, which is insidiously replaced by totalitarianism. Sometimes when I look at today’s European Union, I cannot help thinking about Winston Smith. I can see him walking on the street two steps ahead of me. Isn’t that scary! We, who think differently, have no easy road ahead of us. Eurosceptics are not tolerated. Europhiles try to make us look ridiculous fools. They try their best to make fun of us. Have you noticed that so-called EU experts are all in favour of stronger union and deeper integration? To me they seem like pets of the Europhiles. The Europhiles who refuse all suggestions for cooperation. The political elite promote centralisation and integration without seeing that it erodes Western democracy and national sovereignty – values which are inherently European and immensely dear to us. Those fat cats in Brussels know all this, but they prefer their own deceitful lies. They stumble over the truth every day but all of them just pick themselves up and hurry off as if nothing had happened. And quite frankly, I don’t feel sorry for those people. Just like George Eliot, I never have any pity for conceited people, because I think they carry their own comfort about with them. One thing that puzzles and confuses me is the idea that the EU is something permanent, something eternal. One Grand Old Man in Finnish politics, Paavo Väyrynen – our Peter Mandelson – declared some 30 years ago that the Soviet Union will stay for ever! In the 1980s most Finnish politicians believed that the USSR shall always be our next door neighbour. And the same reality has applied to several empires: the Franks – the Frankish Kingdom, Ottoman Empire, Roman Empire, the Third Reich… They were all supposed to last for ever. And the same applies to the EU as well. We have it now, but for how long, that’s something we don’t know for sure. Besides, the European Union is far from being perfect. It has a myriad of flaws that shouldn’t and cannot be ignored. As Europeans, it is our duty to try to improve the union. That is why my party and I welcomed David Cameron’s Europe Speech with open arms. It presented pragmatism we so desperately need in the EU. I need to say I really admire that British pragmatic stance and I always feel at home in a euro-sceptic country. I already mentioned Mr Cameron and now I also wish to mention another pragmatic, great British Prime Minister who understood how you should deal with the EU. Margaret Thatcher. In the late 1990, after realising she was compelled to step down, Prime Minister Margaret Thatcher defended her policy and her government and their achievements in the House of Commons. ”It is a vision which stems from our deep-seated attachment to parliamentary democracy and commitment to economic liberty, enterprise, competition and a free market economy. No government in Europe have fought more resolutely against […] unnecessary regulation and bureaucracy and increasing unaccountable central power at the expense of national Parliaments. That is pragmatism. That is a vision we should follow. If we look around, we can easily see that the European citizens are sceptic towards the European Union. Most people think the EU meddles with issues it should have nothing to do with. It’s wasting a huge sum of money every year, it is millions of miles away from everyday life, and its pompous leaders have sat on a gravy train for too long. Far too long. And their yes-men are no better: They come to me, the propeller whirling on their cap, and say: Hey Timo! Look: everything’s so fantastic. We’ve got Barroso – we’ve got van Rompuy. And who says God doesn’t give on both hands!? That is why Prime Minister Cameron and I want to renew the EU and renegotiate our memberships. In Finland, we talk about the Soini-Cameron line. When the Finnish leading politicians campaigned for the euro and the Finnish joining some 10 years ago, the eurozone was a mystified, almost magical thing that could solve all our problems and that is second only to a paradise. We had to get in, no matter what. And, as lately as two years ago, the same Finnish politicians, with the fat cats in Brussels, declared that the euro is a success story! Success story! Can you believe it? They even printed the wonderful news on post cards. In all Eurozone languages. Even in Greek: Euro – a success story! Just two years ago. Now, unemployment rate amongst the young people in Greece is 62 per cent and nobody is talking about success. And what about the eurocrisis? After more than 20 EU final crisis summits and hundreds of billions of euros later, there is still no solution in sight to the European crisis. The current bailout mechanisms are obviously not working. The debt burdens are not decreasing – they are increasing. Greece’s debt today, after three bailouts and the largest debt default in history, is larger than it was in the beginning. Bailouts do not support average Europeans. In the crisis countries, they are likely to be unemployed with plummeting standard of living. In the paying countries, people are being burdened with enormous liabilities ensuring that their productivity disappears too. In Finland, one of the paying countries, we can see how this reality is gaining ground. The only thing that the bailouts are achieving is transfer. They take the problem away from the banks and place it squarely onto the shoulders of the European taxpayer. The only ones who are benefitting are the politically well-connected banks and speculators who are rapidly cutting their exposures – and keeping the profits from their erroneous risk taking. You get it? In other words: Heads: I win, tails: well, I win little less. For the productive economy the bailouts are achieving precious little. This is the main reason why The Finns Party and I have steadfastly stood against the bailout madness right from the beginning. This logic is getting resonance, not only among the economists. You only need to look at the demonstrations in Southern Europe and polls to see the deep disapproval. In Finland, in the recent national poll, 66 per cent of our citizens opposed further bailouts while only 22% being in favour. Indeed, I am often asked about the bailouts’ legal, moral, realpolitik, and economic facets. As a legal question, not only did we not commit to bailouts, but the treaties under which we joined, explicitly prohibit any fiscal bailouts between nations – and the central bank from financing governments. Finland is also one of the very few countries that always lived within the budget deficit and maximum debt rules, throughout the euro’s history. The irony is that by agreeing to these bailouts, we are also likely to break the founding principles. As the Finnish president Sauli Niinistö has also noted, the moral consequences are even more important. It is often assumed that this is rich North helping poor South. Unfortunately, this is not true. Whilst the northern governments appear in better shape than their southern counterparts, at the household level the case is often the opposite. For example, the household net financial wealth in Finland is actually below that of all the crisis countries. Similarly, the household disposable income is lower, excluding Portugal. The reason is simple: in Finland, the overall tax burden is 43% of GDP, whereas in Greece, Portugal, Spain, and Greece it is over 10% lower. Indeed, one could claim that the European countries are following two different business models: Some countries with high taxes, low borrowing, and poorer households. Others with lower taxes, higher government borrowing, but wealthier households. It is increasingly difficult to justify to Finnish tax payers why they should pay their high taxes twice. Defenders of the euro often say that the single currency is indispensable for Finland as Finland is an export-oriented country. We are dependable on export trade. However, in Finland, less than 15% of all exports go to the Euro countries if we exclude Germany and Holland. We export more to Kazakhstan and Bangladesh than either to Portugal, Greece or Ireland. Can you see why it is hard to rationalise that the bailout billions are used to save domestic jobs. All these bail-out mechanisms would probably be tolerable, if they were actually working. Unfortunately, they are not. As in any market economy, the only viable solution is the freedom to fail, not continuous moral hazard. We must face the reality: Restructuring is needed to make debt levels sustainable. Banks and speculators must accept the losses from their unsound investments. Insolvent banks must be either recapitalized or shut down. Otherwise, the bailouts’ enormous size will create a true long-term economic shackle not only to us, but to everyone in Europe. Finland’s maximum exposure today is €89 billion. It is a large sum for a country whose entire budget is €50 billion. As I speak, we are eliminating municipalities, reducing social services, and cutting our military and police to save millions – and at the same time we are spending literally billions in the bailouts that are not even working. I am proud to be European and keen to support our common future. However, today’s EU is not Europe, and Brussels’ bureaucracy is not European democracy. European nations should not endanger this great heritage and shared destiny on the altar of political patronage and corporate favours. We will always support and participate when actions are productive and fair. The current European bailouts are neither. I wish to encourage you to look into Europe and European people. Cherish our dear continent and its diverse cultures. I also hope you’ll have the courage and wisdom to notice the big difference between Europe and the EU. It is perfectly all right to criticise the European Union. As a matter of fact, everyone should be able to take part into a fruitful debate. If – and when – we see the union needs some improvement, we must act. There is injustice in this world and probably there will still be some left when we are gone, but that shall not prevent us from trying to make a change. not to support false actions!